Complexity and entropy—or anabolic and catabolic processes—feed each other through circuits called collectively, metabolism. Nature's metabolism encompasses the organic and the inorganic in a continuum of anabolic and catabolic exchanges. The universe is running down, heading toward maximum entropy, or equilibrium, according to physicists. But that conclusion tells only half the story. It describes only the catabolic leg of nature’s metabolism. The opposite tendency, away from equilibrium and toward complexity— the anabolic leg of nature's metabolism—is the concern of complexity theory. The linking of the two processes, anabolism and catabolism, into the higher-order concept of metabolism plants biological thinking at the foundation of the physical world. "The Kabbalists went so far as to try symbolically to diagram reality or, as it were, the divine psyche itself. They envisioned a sefirotic tree. We today are more comfortable with the double helix of DNA or the unified field theory of modern physics, but they're all fundamentally the same: one awesomely integrated organism." Generalizing the concept of metabolism in this way highlights the feedback relationships and interdependencies among nature's various processes, organic and inorganic. Each leg of the metabolic circuit receives as input the output of the other: complexity grows from unorganized raw material, and entropy turns organized complexity back into unorganized raw material. The processes enlist one another to create circuits that provide feedback, which stabilizes the whole of nature. The process gives that whole an organic quality. "For the early Greeks quite simply, and with some qualification for all Greeks whatever, nature was a vast living organism, consisting of a material body spread out in space and permeated by movements in time; the whole body was endowed with life, so that all its movements were vital movements; and all these movements were purposive, directed by intellect. This living and thinking body was homogeneous throughout in the sense that it was all alive, all endowed with soul and with reason; it was non-homogeneous in the sense that different parts of it were made of different substances each having its own specialized qualitative nature and mode of acting. The problems which so profoundly exercise modern thought, the problem of the relation between dead matter and living matter, and the problem of the relation between matter and mind, did not exist. There was no dead matter, for no difference of principle was recognized between the seasonal rotation of the heavens and the seasonal growth and fall of leaves on a tree, or between the movement of a planet in the sky and the movement of a fish in the water; it was never for a moment suggested that the one could be accounted for by a kind of law which did not even begin to account for the other." Metabolism in this general sense enables natural forms to persist for extended periods in states that are far from equilibrium. If complexity theory and the second law of thermodynamics describe essential tendencies of nature, from the largest to the smallest physical systems and from the slowest to the quickest processes and spanning the organic-inorganic divide, then nature’s essential activity, her foundational process, must be metabolic. The biological organisms that populate the Earth are the metabolic systems that are easiest for scientists to observe in detail, because their behaviors occur on scales near the human scale. The scientific understanding of atomic and galactic processes, for example, is necessarily less exact than the understanding of biological processes, because biology is so much nearer at hand. Scientists can get a solid handle on events that occur on scales from inches to miles and from seconds to decades. Grasping events that occur on scales of angstroms or light years and picoseconds or eons poses a greater challenge. However, as research proceeds, the star larvae hypothesis expects the discourse across scientific disciplines to converge on concepts drawn from biology. The Earth, for example, actively maintains its characteristic chemical and thermal conditions so as to retain a biosphere that is suitable for life, which is one that operates far from equilibrium. This characterization of the Earth constitutes, in broad terms, the Gaia hypothesis of James Lovelock. The British scientist proposes that the Earth is suitable for life because life itself, through chemical feedback loops that operate across ecosystems, stabilizes the chemistry of the atmosphere and oceans (see Lovelock’s Gaia: A New Look at Life on Earth). The Earth’s biosphere is a collection of interdependent, interlocking processes of material and energy recycling that cooperate to keep the terrestrial environment fit for life. The processes of entropy—decay, deterioration, breakdown—the processes that liberate materials and the complimentary processes of construction, building up, and organization are discernible throughout the Gaian body. "Everything is melting in nature. We think we see objects, but our eyes are slow and partial. Nature is blooming and withering in long, puffy respirations, rising and falling in oceanic wave-motion. A mind that opened itself fully to nature without sentimental preconception would be glutted by nature's coarse materialism, its relentless superfluity. An apple tree laden with fruit: how peaceful, how picturesque. But remove the rosy filter of humanism from our gaze and look again. See nature spurning and frothing, its mad spermatic bubbles endlessly spilling out and smashing in that inhuman round of waste, rot, and carnage." Lovelock describes Gaia as being in a state of stable disequilibrium. Gaia operates far from equilibrium, not in a haphazard way with wild fluctuations, but with remarkable stability. For what now has been at least three billion years, terrestrial conditions have remained within the narrow chemical and thermal range that has enabled life to proliferate and evolve. Lovelock lists ranges of specific physical conditions within which Gaia must remain to survive as a living entity. A slight decrease in the proportion of oxygen in the atmosphere, for example, would suffocate all but the anaerobic forms of life. A slight increase in oxygen level, and the planet’s surface would incinerate. Similarly with other gases in the atmosphere and with the chemical composition of the oceans: Earth's chemistry is finely tuned to keep life alive. But the fine tuning is not a lucky fluke. Lovelock suggests that, through the use of feedback controls, biology itself maintains the Earth’s stable disequilibrium within its narrow bio-friendly range of physical conditions. Tendencies toward imbalance in the proportions of gases in the atmosphere, for example, are met with changes in the planetary metabolism—increases or decreases in oceanic algae production, for example—that redress the imbalance. The Earth and its biosphere constitute a spontaneously self-organizing complex system. The carbon cycle, the nitrogen cycle, and similar recyclings of materials that operate globally, taken collectively, constitute the Gaian metabolism. Despite differing vastly in size and duration, biological cells and remote galaxies possess a trait common to all organisms. They give, and they take in a way that suggests, as does the Gaia concept, that metabolisms do not operate exclusively inside of organisms. They span organisms..
Organisms contribute material to their environments, and they acquire material from those environments. This give and take, or sharing and borrowing, is an essential aspect of metabolism. Unexpectedly, researchers have discovered that the sharing and borrowing among cells and among galaxies is much more involved and prevalent than previously had been thought. “Yamashita’s tubes joined a growing catalogue of cryptic conduits between cells. Longer tubes, reported in mammalian cells, seem to transport not just molecular signals, but much larger cargo, such as viral particles, prions or even mitochondria, the cell’s energy-generating structures. These observations suggest an unanticipated level of connectivity between cells, says Amin Rustom, a neurobiologist at the University of Heidelberg in Germany, who first spotted such tubes as a graduate student almost 20 years ago. If correct, he says, “it would change everything in medical applications and biology, because it would change how we see tissues”. But biological cells aren’t the only entities in nature that exchange their constituents freely. Neighboring galaxies do it, too. Research in recent years suggests that, for example, up to half of the Milky Way’s matter arrived from other galaxies. “This study transforms our understanding of how galaxies formed from the Big Bang,” said Professor Claude-André Faucher-Giguère, a co-author of the study and assistant professor of physics and astronomy in the Weinberg College of Arts and Sciences. Why some material kicked out of large galaxies might not find its way to nearby smaller ones goes unremarked. Just as the cells of a body exchange their wares, so too, evidently, do the galaxies of our universe. 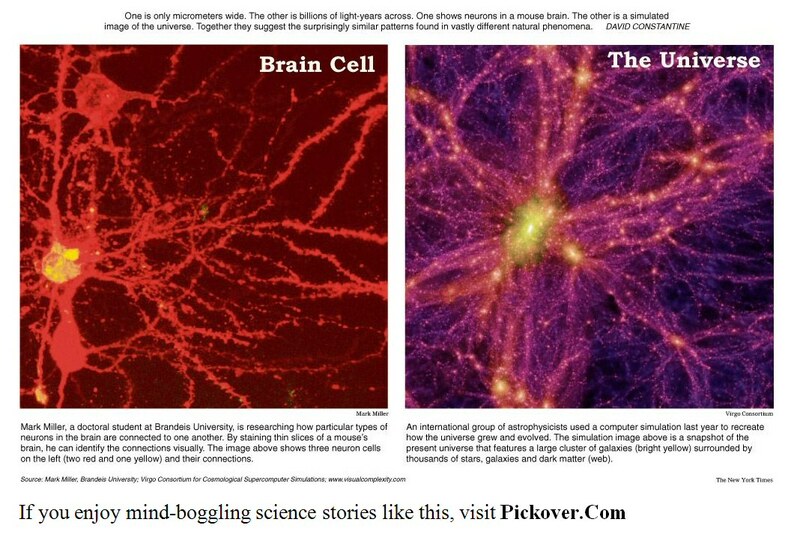 These “internets” of cells and of galaxies that circulate their contents among their fellows would seem to rob cells and galaxies of their individuality, their independence, and show them to be enmeshed in processes that constitute interdependent relationships with their peers. Whether the findings described here tend to make galaxies seem more like cells or cells more like galaxies is a matter of a coin toss. The notions of metabolism and symbiosis apply broadly. The star larvae hypothesis takes these findings as indicative of research results yet to come. The hypothesis predicts that the universe’s so-called inorganic processes will be shown to be aspects of metabolism in a broad sense, because the physical world consists of nested sets of organisms, some nuclear, some chemical, some gravitational and some perhaps of other natures, all related ecologically. The ebb and flow of nature’s creative and destructive processes—of her energies and materials—compose a metabolism itself comprised of metabolisms, from quantum fluctuations to cosmological churning. The overarching trend in this universe, so far at least, has been one of increasing complexity arising in nature as time passes, from the near homogeneity of the first millisecond that followed the Big Bang to the countless arrangements of matter that constitute the mature galaxies, solar systems, the terrestrial biosphere, and the ecosystems and now cities that ornament the Earth and potentially other planets. The implication is that the universe is still in an active growing phase, part of a life cycle that began with a bang and might end with a whimper, but sustained during its lifetime by bogglingly complex and interwoven metabolic processes. This way of looking at nature, putting biological notions in the center of the conceptual map, is atavistic. It recalls ancient, archaic conceptions of nature, in which the cosmos was conceived as being a living environment—as being alive in its motions, ensouled. The most primitive religious conception of nature apparently was one in which every discernible natural process was seen to be alive, or at least to participate in animate processes. The idea that nature at its foundation is nonliving and that life is a local aberration moving in the "wrong" direction (away from entropy), is a very modern conception of nature and of biology’s place in nature, and this concept has helped alienate the modern mind from nature. The alienation has gained steam steadily since the Enlightenment, but now it might be waning as ecological issues force themselves on the consciousness of the industrialized world. The ancient conception (of nature as a whole and in all of its parts constituting living processes) was revived in modern times by a small number of philosophers, including mathematician Alfred North Whitehead. He placed the concept of organism at the center of his understanding of nature. For Whitehead, the concept of organism superseded attributes of organic and inorganic and ultimately even the concepts of objectivity and subjectivity. Organism is the fundamental unit of natural organization, in his philosophy, of those things that actually exist. It is the organizational pattern and process of being/becoming. "My point is that a further stage of provisional realism is required in which the scientific scheme is recast, and founded upon the ultimate concept of organism. [. . . . ] The concept of the order of nature is bound up with the concept of nature as the locus of organisms in the process of development." 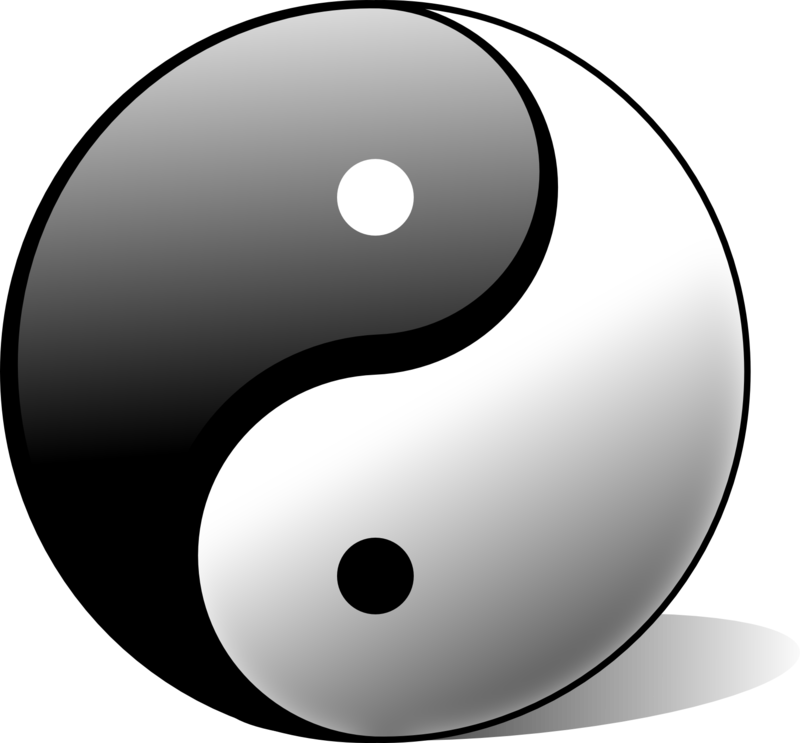 The Taoist yin-yang symbol represents the harmonization of opposites into a unity—as of anabolism and catabolism into metabolism—as a metaphysical principle, an archetype of dynamic feedback processes that underlies the forms of the physical world. "The problem is one of cellular psychology, sociology, or ecology, and then of molecular psychology and ecology. Finally, everything is a matter of individual and social psychology, on we know not how many levels"
A human being is a relatively small organism, with a chemical metabolism. A galaxy is a relatively large organism, with a nuclear-gravitational metabolism. The star larvae hypothesis proposes that such metabolic characterizations apply generally to nature and, if substituted for the concepts and language of complexity theory and thermodynamics, provide a unifying perspective from which to view nature’s operations on any scale and across scales. The metabolic rivals, anabolism and catabolism, map onto the ethical rivals of good (creative) and evil (destructive) tendencies, hence the mythical rivals of God and devil, in their various flavors across cultures and times. The rivals/opposites feed one another in a self-sustaining circuit. The conquering of one leg of the circuit by the other is a misguided hope, a quest for an impossible stasis. The dynamic interplay between the two sides of the equation produces the stability needed for events to proceed, for reality to get on with its requirements and responsibilities--with its life. Metabolism, physiology, anatomy, development, descent, symbiosis, parasitism, mutation, metamorphosis, ecology, and other concepts from biology might more usefully describe, than do the vocabularies of thermodynamics and complexity theory, what occurs in nature—in and among atoms, molecules, crystals, bacteria, humans and their societies, ecosystems, planetary biospheres, solar systems, galaxies, superclusters of galaxies, and whatever other organismic structures and processes to which the universe has given rise (or still might). What, for example, has the study of stars revealed? That stars are born, that they progress through distinct developmental stages, and that finally they die. (A peculiarity of astronomy is the use of the entrenched term, "stellar evolution," when what is meant is "stellar development" as it pertains to individual stellar life cycles.) Even given the difficulties inherent in studying galaxies, the latest theories propose that the many forms of galaxies represent particular stages of a generalized galactic life cycle and that the internal processes of galaxies, such as star formation, are controlled by feedback cycles. Astrophysicist Lee Smolin has proposed that parent universes beget baby universes and that universes evolve by natural selection. As much as scientific fundamentalists might resist applying the language of livingness to anything outside of biology, dismissing such applications as metaphorical, the biological shoe nevertheless seems to fit. And this deep ordering principle—the general applicability of biological relationships and operations—expresses itself also through the structures and processes of human industry. The industries of human enterprise, no less than those of bees or beavers, ought not be considered an anomalous or unnatural development. Life is not a fluke in the physical world, an unlikely localized countertrend to the iron law of entropy, and neither is its industry. Life, as a tendency to metabolize, to interweave catabolism and anabolism, drives the forms of the physical world, both the terrestrial and the extraterrestrial, the organic and the inorganic, the "natural" and the "engineered." Growth and decay alike are local phenomena, always occurring within the context of and subordinate to, a superordinate metabolism. Nature in this view is defined as a nested hierarchy of organism-ecologies, in which the discernible units, the stable disequilibria, function simultaneously as organisms that participate in ecologies and as ecologies constituted of subordinate organisms. In a seamless web.